Info: Created on 21st August 2010 . Last edited on 31st May 2011. I think the 'k' stands out a bit, but what an awesome font! I'm trying to create other glyphs too. I like it very much! If you are able to add uppercase and some punctuation etc., I think this font could go well for a Top Pick, in my opinion. I am happy you liked it. Other glyphs are under construction. Plenty of work. 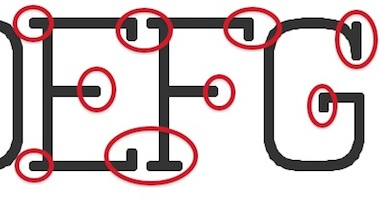 I think, you could make the design more consistent by eliminating the few remaining sharp endings and make them rounded (f,g,r,t,y), plus add a few missing serifs. There are some jagged contours/missing bricks repeated many times throughout the set by cut-and-paste operations. @Agent Demonic Ladybug:Thanks! I have added many more glyphs. @Frodo7: Huge Thanks for your comment and pointing the mistakes here. This is some irresponsible fontstruction by me. I have made changes and added other characters. What do you think about the newly added characters? This is pretty clean work. 4 is standing out a little because of two serifs. I think the serif in the base of "4" is fine, goes well with the design, but not the one at the side. Try removing the crossbar from "0". I am loving "a" "e" "s". 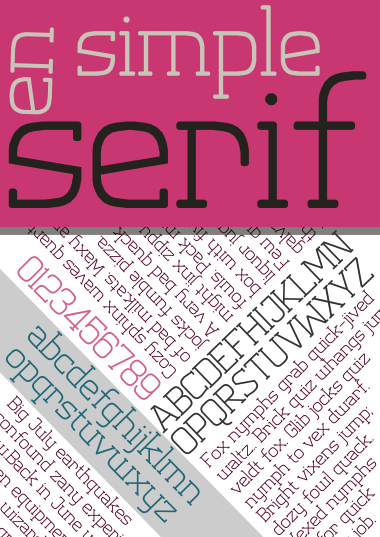 A great font I must say. • Apply some trapping to where the two curves meet on your B and both sides of your 8. • Shift the beak on your S to the left until optically balanced with the (potential) overshoot below it. Also applies to G. Lowercase seems to work well without this optical correction. • L feels a bit too wide. D, G, O, Q, T feel a bit too narrow. Y could use a lower crotch like M (at least like X). • e, m, o, w look too narrow. c, v, x appear slightly too wide. • I suggest you remove the serifs from the bottom of V and v. The lower right serif on N is too big and/or unnecessary. • You can get away with the creative Mm pairing, but I think Ss and Ww need to be more closely aligned. S is easy, just stick with the cool angled spine of s (whichever angle is most appropriate, that is). If you can’t make a fitting w with straight lines, give it the lower-right serif of your u. • Try raising the ascender height for b, d, h, k, l by one brick. • You may want to match the ascender treatment on these characters to your l (ell). • In fact, and this is a stylistic choice, the baseline serifs on your lowercase (h, k, m, n) can be similarly one-sided. Take m for example: the left-most vertical stroke should terminate in a symmetrical serif, but the middle and right-most strokes can terminate in serifs that points only to the right. Done properly, this makes for more attractive and dynamic forms and improves legibility. These are all my opinions, and very nit-picky critiques at that. But I feel strongly that such a promising and already successful design deserves equally diligent revision and refinement! Wonderful. I agree with @snhussain – Have you thought about a zero without the crossbar? - maybe just narrower to distinguish it from the O? @meek: yes! I am going to work on it. Let us see how it comes out. @will.i.ૐ: I was surprised to see your very very long comment. Thanks!! This shows that you are an expert in typography and also a good person. Certainly this work needs refinement. I shall solve the issues one by one. You’re more than welcome, Naveen! This fontstruction is already outstanding in its details and deserves every bit of attention I gave. Please take my critiques under consideration and feel empowered to make the final calls as you see fit. I thank you for your kind words and look forward to future editions! This fontstruction has been much improved. TP or not TP it's a Greeeeeat font! Congratulations! FontStruct Staff have deemed your FontStruction worthy of special mention. 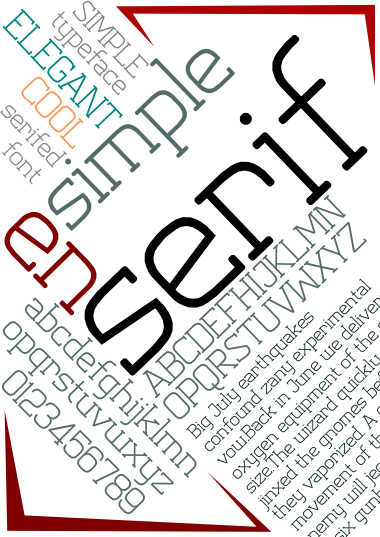 “en simple serif” is now a Top Pick. Looks great! Only 1 suggestion. Maybe add trapping (correct term?) to the m. I honestly don't love the current style. @BanjoZebra: Thanks for your suggestion. I thought of improving the m. But, left it as it is because it is the characteristic glyph of this font. As of now basic latin set has been completed. very very strong work here BRAVO! @Upixel: Look at the ends of the lines... Fine and Fantastics! Tell me how the make something like this!!? ?